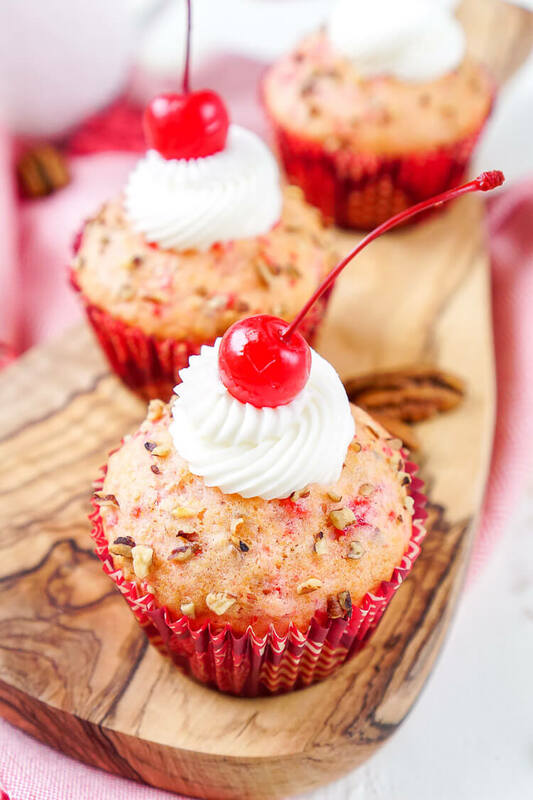 These Cherry Pecan Cream Cheese Muffins are a fun breakfast that borders on dessert! When I was a kid, I pretty much begged whoever I was with at the grocery store to get something yummy from the bakery case. I didn’t always get my way, but when I did I usually skipped over the donuts for a MUFFIN! But not just any muffin, I always went for the cream cheese filled ones. 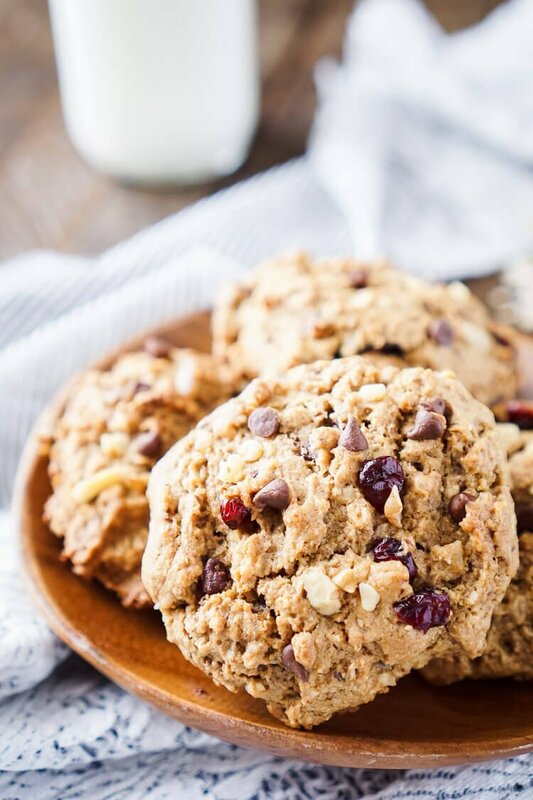 You see I could get a blueberry or banana nut muffin whenever my Mom or Grammie made them, but the ones with filling, well, they were a whole different story. 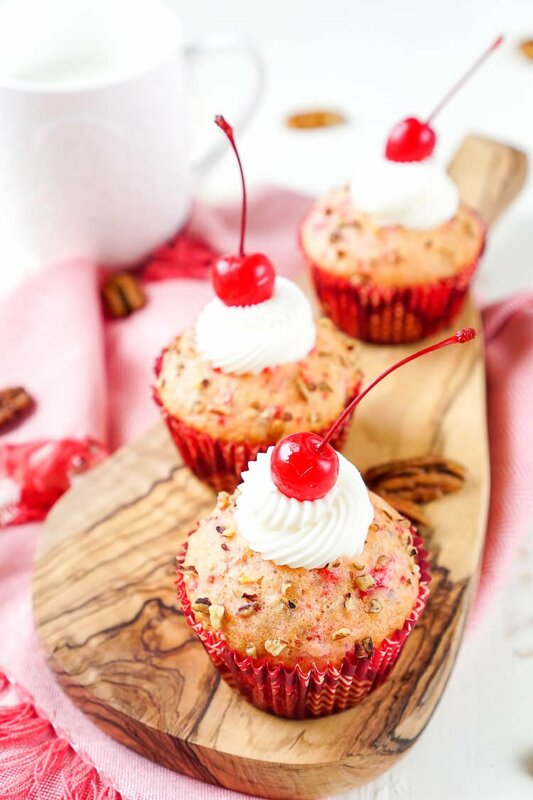 And I’ve grown out of the traditional pumpkin, carrot, and chocolate muffins filled with cream cheese and moved on to prettier, but equally tasty flavors, like these Cherry Pecan Cream Cheese Muffins. Now that we’re adding fruit into the mix, we mine as well call these breakfast cheesecakes or something, right? 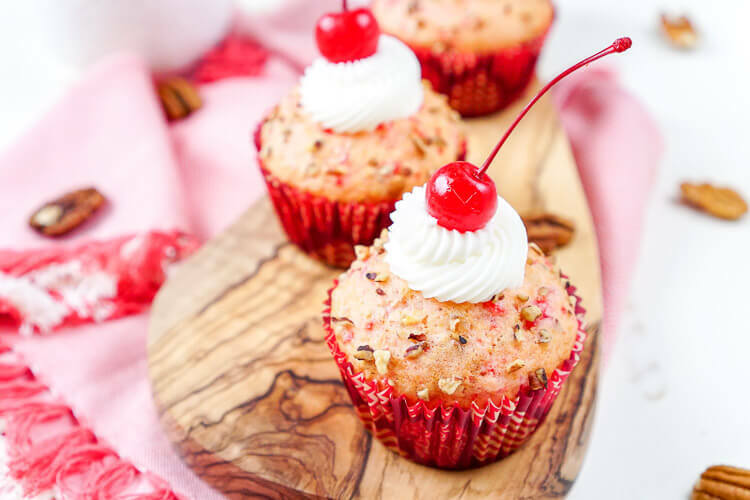 But seriously, the bits of maraschino cherries paired with the tang of the cream cheese and a sweet hint of almond make these a muffin you’ll want to add to the recipe box! Plus, the red and pink make them perfect for Valentine’s Day! 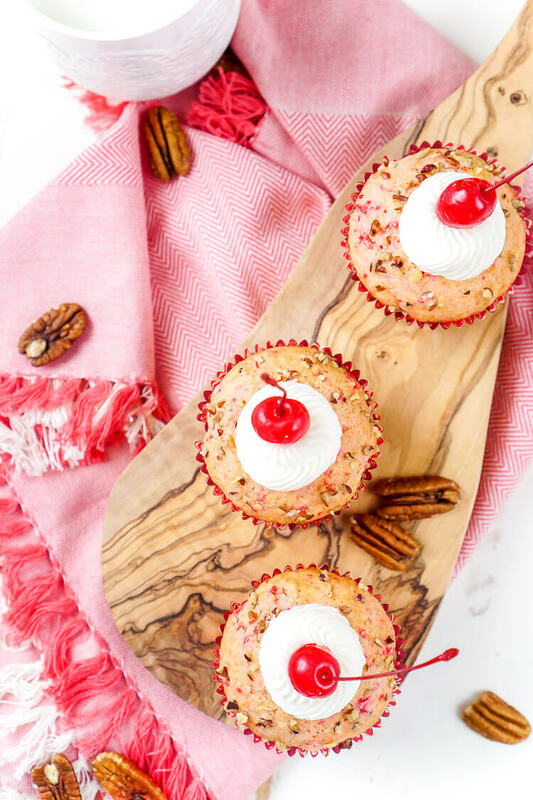 These Cherry Pecan Cream Cheese Muffins are a fun breakfast that borders on dessert! 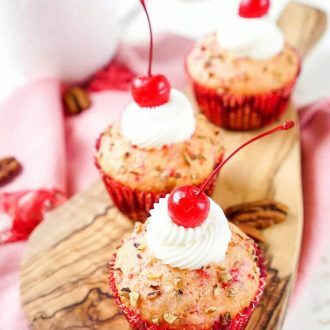 These muffins are loaded with cherry and pecan pieces and filled with a silky cream cheese filling with a hint of almond! Preheat oven to 375 degrees F and line a muffin pan with liners. In a small bowl, whisk together flour, sugar, baking powder, and salt and set aside. in a large bowl or stand mixer fitted with a whisk attachment, beat together egg, oil, and milk. Slowly add in the dry ingredients just until combined. Drain and rinse cherries. Set 12 stemmed cherries aside and remove the stems from the others and add the to a food processor or blender. Pulse until cherries are little bits and add them to the batter with 1/3 cup of the pecan pieces. Beat for about 10 seconds until cherry bits and pecans are full incorporated. Fill liners about 2/3 full with batter and sprinkle with remaining pecan pieces. Bake for 18 to 20 minutes until toothpick comes clean when inserted into the center. Transfer to cooling rack to cool. Once cooled, core the center of the muffins about half way down. 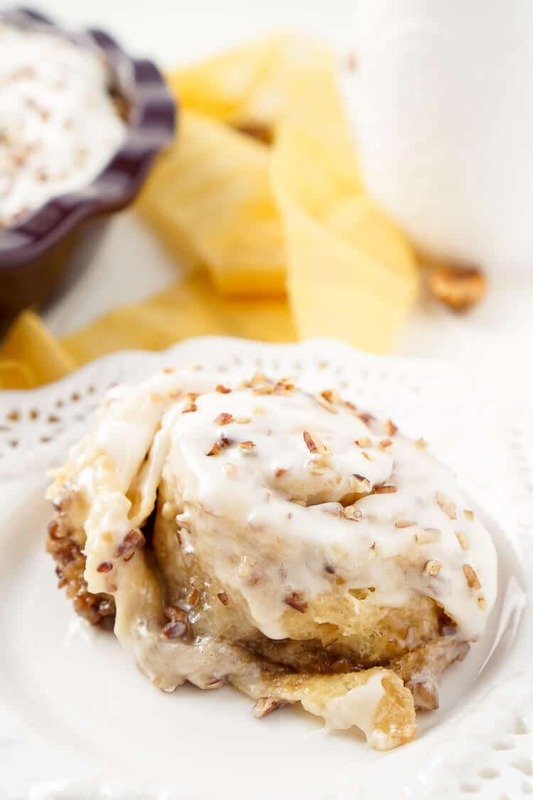 Add cream cheese, confectioners' sugar and almond extract to a small bowl or stand mixer and beat until smooth, transfer to a frosting bag or decorator tool and pipe filling into the cored out muffins. 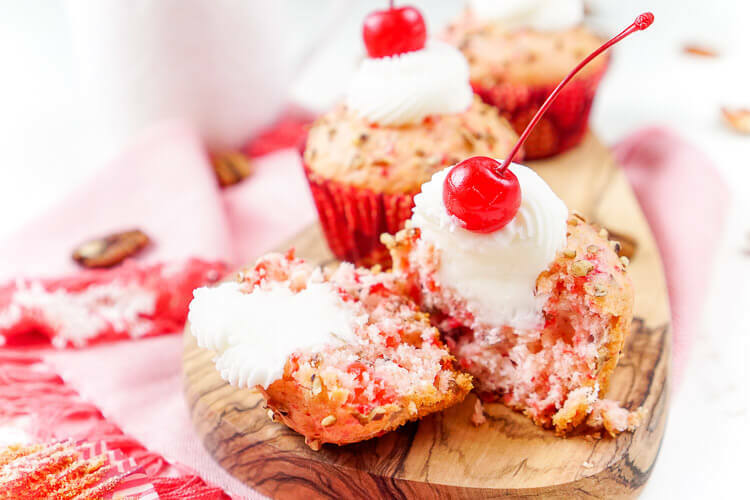 Top each muffin with one of the cherries you set aside earlier. These are beautiful little muffins – and hello??? Cream cheese frosting/filling? Yes, please! Right! It’s the perfect touch for any muffin, in my opinion! These do look perfect for Valentine’s Day! Also, just FYI your photography is amazing! Keep up the good work. 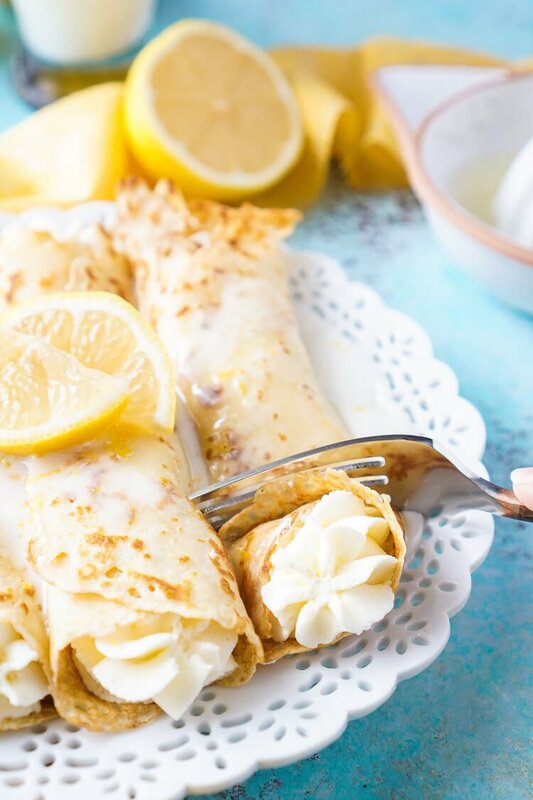 I would eat this for breakfast and dessert , no doubt about it ; They are too cute and perfect for this time of the year. YUM!!!!! Thanks so much for stopping by and for your sweet comment! These look so pretty n fresh. Great for coming Valentines. Yes, they’d be perfect for Valentine’s Day! These are almost too cute to eat, but with that frosting, I would definitely eat a few — or more! I know, right! I just can’t resist! All these delicious goodies I see online makes me want to go on a sugar binge. Yum! Not good for my health.